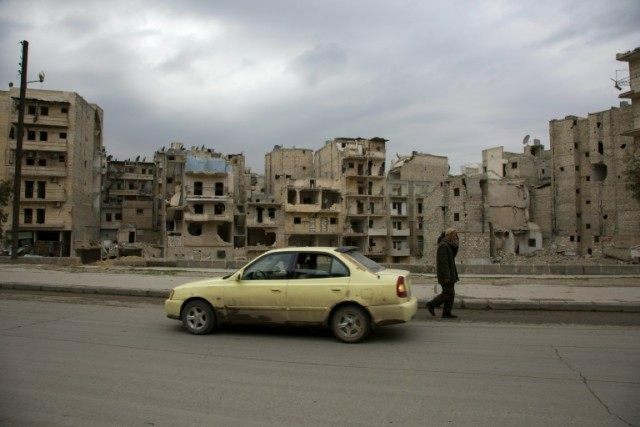 Beirut (AFP) – Twenty-two civilians were killed in an exchange of fire in Syria’s second city Aleppo, a monitor said Sunday, in one of the highest single tolls since a fragile truce came into force. Nearly all warring parties in Syria — the regime, rebels, jihadists, and Kurds — have carved out zones of control in war-torn Aleppo province. Since February 27, a truce has seen violence drop across parts of Syria, including the provincial capital of Aleppo city. But renewed violence in the northern city during the past 24 hours has seriously strained the truce, the Syrian Observatory for Human Rights said on Sunday. At least six civilians were killed and eight wounded in regime air strikes on rebel-held eastern parts of the city on Saturday. And a barrage of rockets and sniper fire by opposition groups onto government-controlled western districts killed 16 civilians, including 10 children and two women. “There’s a clear escalation. This was the bloodiest incident in Aleppo and its province” since the ceasefire took effect, said Observatory head Rami Abdel Rahman. Brokered by Russia and the United States, the agreement to cease hostilities excludes the fight against the Islamic State group or Al-Qaeda’s affiliate in Syria. The truce had largely held across parts of Syria since late February, despite frequent accusations of breaches on both sides. But violence around Aleppo has sparked concerns the ceasefire may peter out, partly because rebels are involved in the battles too. IS jihadists have seized fresh territory from rebel groups in recent days, threatening the key opposition bastion town of Azaz, just eight kilometres (five miles) south of the Turkish border. The jihadist onslaught has forced 30,000 Syrians to flee, and tens of thousands more are at risk of displacement. Since the Syrian conflict erupted in 2011, half of the country’s population has been displaced — including five million who have fled to neighbouring states.